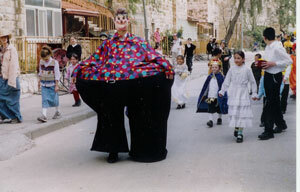 Purim in Israel in the Hebrew calendar falls on the date of Adar 14 each year but the date is different each year for the Gregorian calendar. The day commemorates the Jewish people being saved from death from Haman around the fourth century BCE according to the book of Esther. People will listen to the Megilla in in effort to experience the story told in Esther, Haman and Mordecai. Some will twirl graggers and stamp their feet when Hamans name is mentioned. It is also a day to give to the poor. Food and other gifts are calendar to help those in need. Some areas will celebrate with carnivals that involve costumes, and festive games. Back in the times of the Persian empire, Haman the royal vizier to the King Ahasuerus planned to kill all the Jews in the empire but the plan was stopped by Mordecai and his adopted daughter Esther who had risen to become Queen of Persia.